As someone with two middle names, I know the difficulty of getting them all onto official forms. 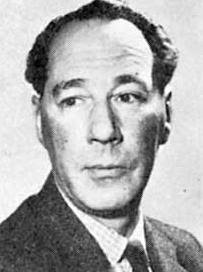 Let's spare a thought, then, for John Wyndham Parkes Lucas Beynon Harris, born 1903, died 1969, and, as John Wyndham, one of the greatest science-fiction writers of the last century. 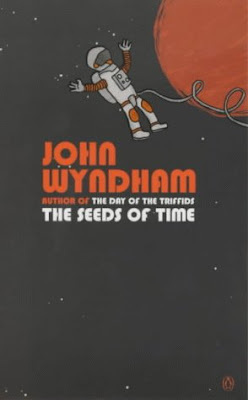 Any blog which has as one of its obsessions the end of the world can't neglect John Wyndham. 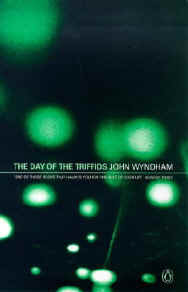 In The Day of the Triffids he wrote one of the genre's masterpieces. It's a wonderful book: when what seems to be a fantastic and beautiful meteor shower lights up the night skies, almost everyone goes out to watch it. The next morning, they're all blind. This would be bad enough if the world hadn't also come to rely on a genetically engineered ambulent plant, the triffid, which also has carries a lethal sting. 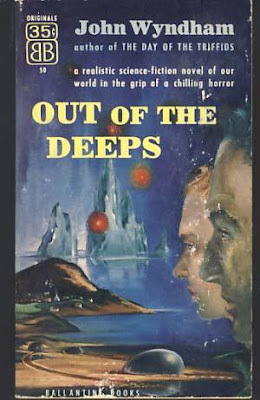 This was the first novel I ever read in one hit, under the covers with a torch at the age of eight, unable to stop. Much of it must have passed me by at the time, but regular rereadings since have not lessened its power. 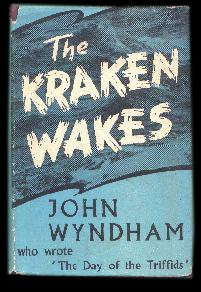 Wyndham ended the world again with The Kraken Wakes (called Out of the Deeps in the US), in which rarely glimpsed acquatic aliens invade the deepest parts of our oceans and then calmly and effectively take over the planet by dramatically raising the sea level. 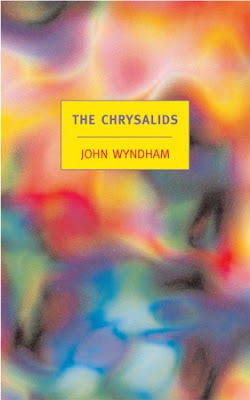 Along with Day, Wyndham's other masterpiece is The Chrysalids (called Re-Birth in the US). Generations after a huge nuclear war, tiny communities scattered around the depleted, radioactive globe struggle to survive. The story is told from the viewpoint of a boy growing up in rural Canada, under a warped Fundamentalist Christian culture obsessed with stamping out mutations that do not breed true. 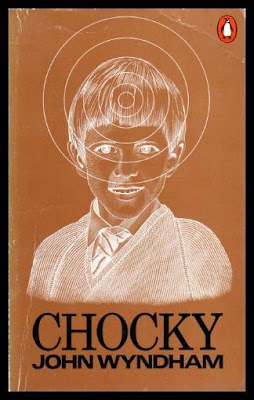 But the boy has a secret, one he shares with other children scattered around the world. It's a brilliant, gripping book. I'll discuss his other books below. But let's begin the cover cavalcade. 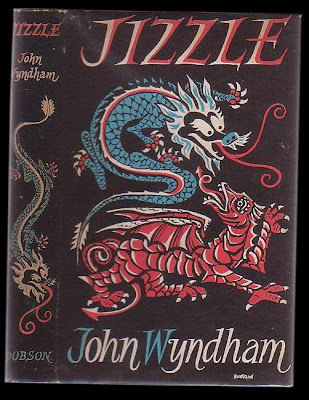 One reason I took so long to get to Wyndham on this blog is the sheer profusion of covers I had to collect. The search for them made my brain hurt. I apologise in advance for the low-quality of some of these images, but with many of them should be able to click for a bigger, more detailed version. Here are the original 1950s and 1960s hardbacks of most of his books, published by Michael Joseph. 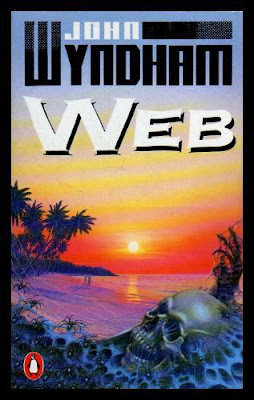 The last, Web, is actually a posthumous work, first published in 1979. It features a group of people trying to set up a utopian community on an uninhabited Pacific island. Uninhabited, that is, except for a new species of spider, evolved under the effects of nuclear testing, which have learned to work as a community. Not one for the arachnophobes. 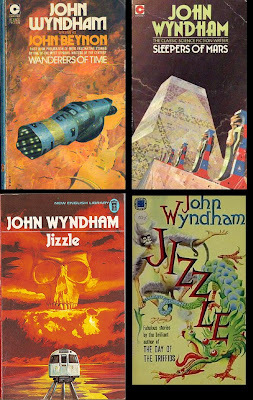 Here are some other early hardbacks--the 1951 Doubleday edition of Triffids, the Dobson edition of Jizzle (a collection of horror stories), and two Walker editions. 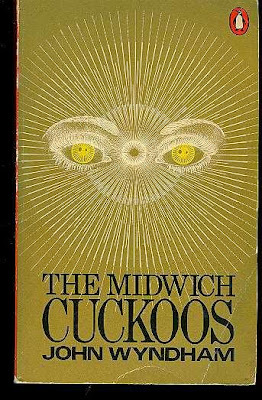 The Midwich Cuckoos cover is by Jack Gaughan. 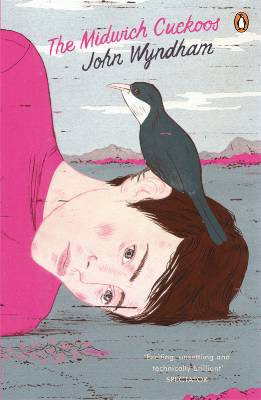 The Midwich Cuckoos is another great book. A UFO appears over a sleepy English village, and erects a force field keeping the world outside at bay. Everyone inside the village is rendered unconscious. All attempts to get in fail. Then, the UFO suddenly departs, and everyone wakes up, unharmed--except that every fertile woman in the village is now pregnant. 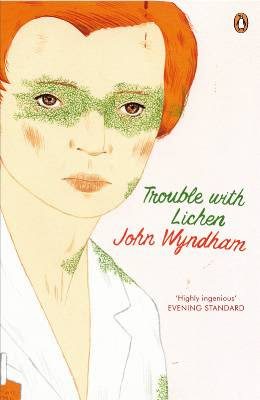 The Trouble with Lichen is a look at what might happen to society after the accidental discovery of a "cure" for ageing. 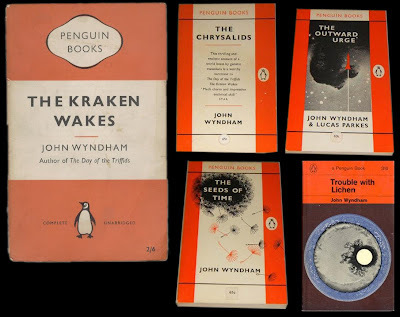 In the UK, Penguin have been Wyndham's paperback publisher from the start. 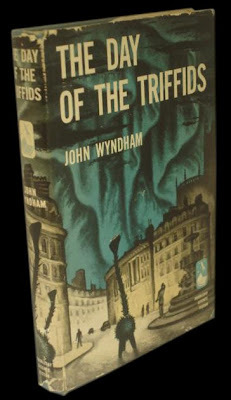 The original Triffids paperback was one of the first Penguins to feature a cover illustration, based on a sketch by Wyndham himself. 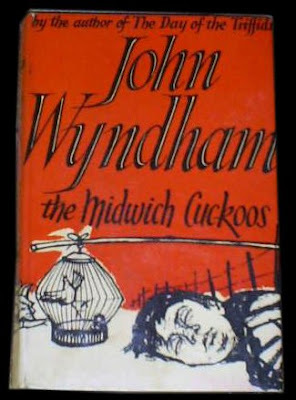 Many other Penguin Wyndhams from the 1950s and 1960s had covers designed by John Griffiths. 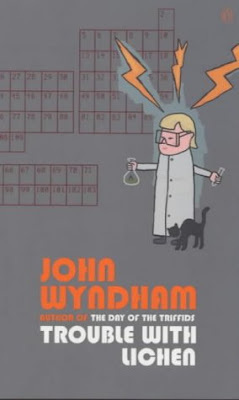 In the 1970s, Harry Willock redesigned the Wyndham range for Penguin. 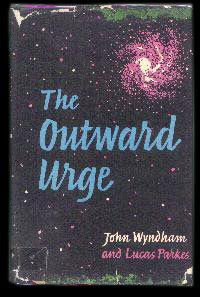 The Outward Urge tells the future of humans colonising the inner Solar System through a series of novellas about one family. The highlight is a gripping thriller where two explorers are trapped together on Mars, millions of kilometres from help, when a head injury sends one of them just a little bit mad. 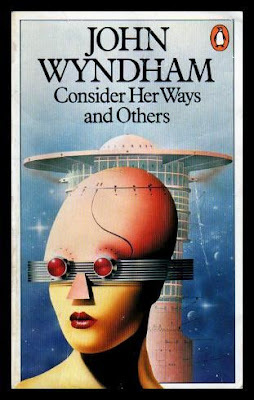 The co-author, Lucas Parkes, is another couple of Wyndham's names--not entirely sure about the quality of what he'd written, as it moved away from his usual earth-bound, present-day milieu, Wyndham invented a co-writer to shift any criticism onto. 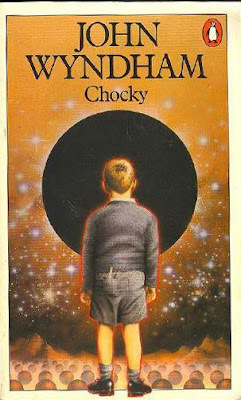 Chocky, one of Wyndham's last books, is a touching story about a young English schoolboy who becomes mentally linked to an alien. 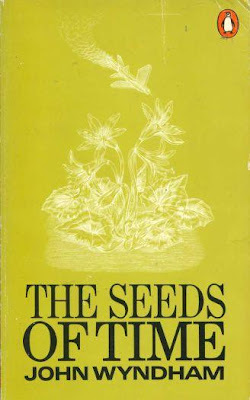 The Seeds of Time, like Consider Her Ways, is a short story collection. 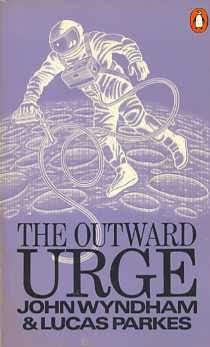 In the early 1980s the books had another redesign, this time featuring painted covers by Peter Lord. These, for the most part, are the editions I borrowed and reborrowed from the local and the school libraries. The series also came as a boxed set. In the late 1980s there was another redesign, with paintings from Mark Salwowski. These are, for the most part, the editions I used birthday book vouchers to horde. 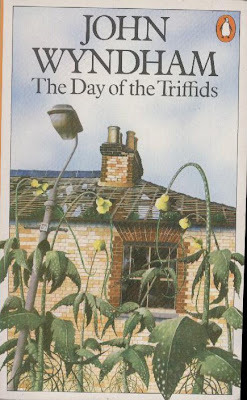 In the late 1990s, Triffids was released as one of the Essential Penguins, a series of very nicely designed classics. And then, in the late 1990s, another redesign, this a rather cartoonish one at the hands of Spencer Wilson. 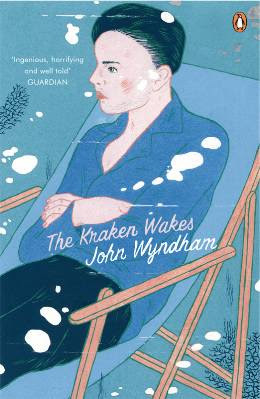 Several of Wyndham's books have also been given the Penguin Classics treatment. 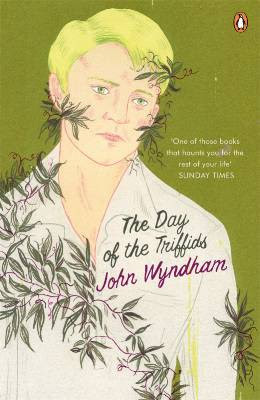 And, to bring us up to date, Penguin have just reissued five of Wyndham's books with new covers by an artist I know not. UPDATE: The tremendously wise John Self has done the research, and says that the cover artist is Brian Cronin. A follow-up post on this chap's other covers is a-coming. But wait! There's more. 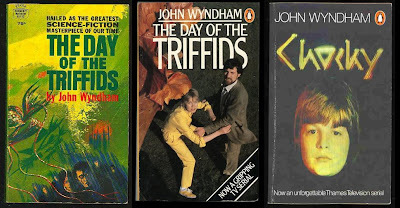 As well as some various random covers I may as well bung in here (including those for the dire Triffids movie, the excellent Triffids TV series, and the excellent children's TV Chocky). 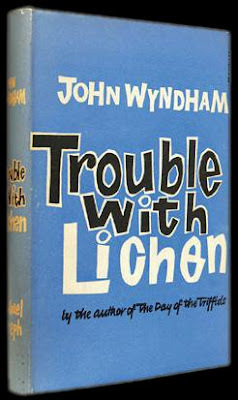 Other paperback houses have also put out Wyndham--Ballantine in the 1950s and 1960s, and Coronet/NEL in the 1970s and 1980s. Tnen there's this hardback edition from Gollancz, as part of their SF Masterworks series. This is a digital image by Fred Gambino. 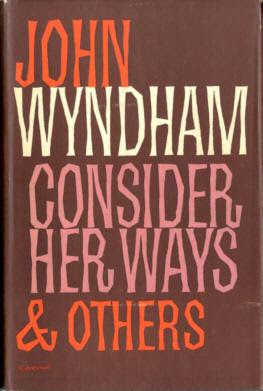 Finally, in the US these days, Wyndham seems to be rather less well known. 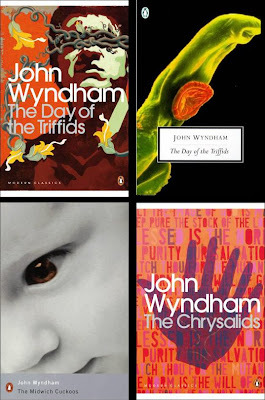 Fortunately for Americans, Triffids is available as part of the Modern Library (as a "lost" classic, oddly enough), and The Chrysalids as an upcoming NYRB Classic. So! You've some reading to be doing. 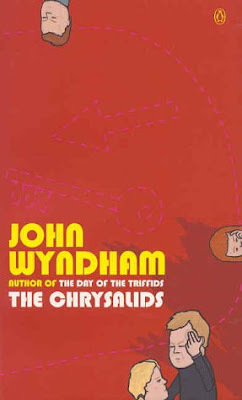 I was excited to see The Chrysalids on the NYRB list, because Wyndham is essentially unknown here aside from Day of the Triffids, which is such a brilliant book that I don't understand why it didn't drive me to see what else Wyndham had written. You've convinced me to at the very least order from the UK the Kraken book and The Midwich Cuckoos; those most recent redesigns are lovely. 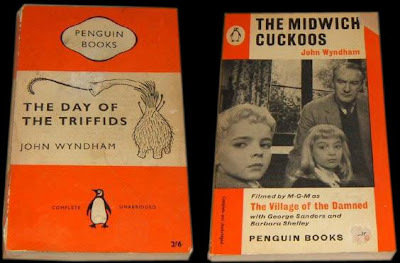 (Though it's hard to imagine a design that could surpass that mid-century Penguin Classics edition of The Midwich Cuckoos that features the photo of the guilty-looking women and the suspicious-looking man. 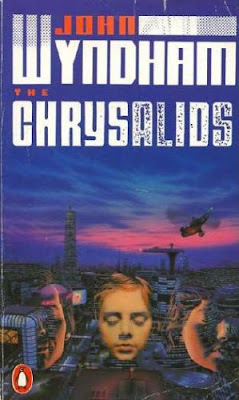 If you loved 'Triffids' it's hard to see how you'll fail to enjoy those others. The edition of 'Midwich' to which you refer must be one I didn't come across. I'll have to do some more hunting--it sounds ideal. 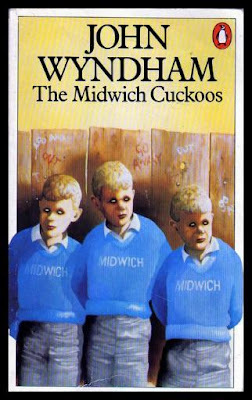 The edition of The Midwich Cuckoos I'm thinking of is this one, which I've just ordered from the Book Depository. 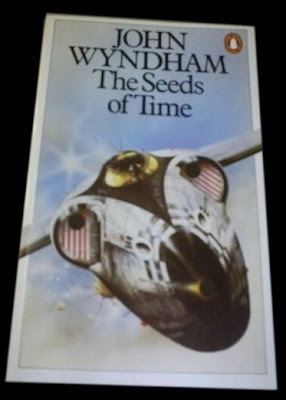 Lovely cover, fitting nicely with the rest of the current batch of Wyndham covers. Phew! I had that one! The Book Depository is great for getting stuff from overseas, isn't it? Far too much of my income goes their way these says. 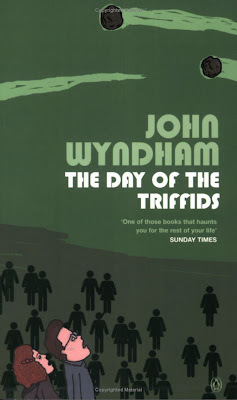 Sadly, the copy of Triffids that I'm about to start reading is the one with the crappy hand-gripping-the-earth cover. It's not a good cover, but at least the contents will be great. 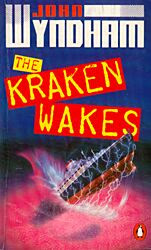 Having written all of this, I've now gone back to reread 'The Kraken Wakes again'. Great stuff. 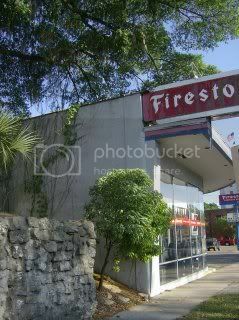 Great comprehensive post, JRSM. 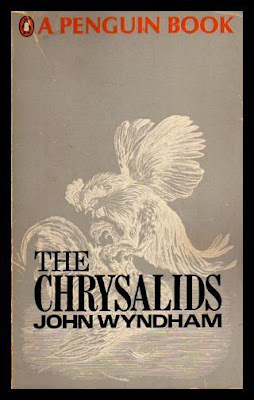 Levi, you will not be disappointed by the NYRB edition of The Chrysalids, which in my opinion is Wyndham's best book by some way. Those new Penguin covers are terrible, aren't they? I had seen one of them but hoped it was a one-off. These look like they should be children's editions issued by Puffin, but have the Penguin logo so must be intended for adults. Yuk. I'll stick with the Modern Classics where possible. Great post (as always). Peter Lord was a colleague of mine in Ottakar's, managing a branch in Lincoln. He is an extremely shy man and I struggled to get him join in any conversations when we were at managers' meetings. 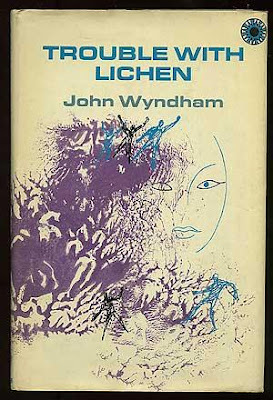 I can't remember how long it was before he eventually mentioned that he'd done the John Wyndham covers (which I grew up with). 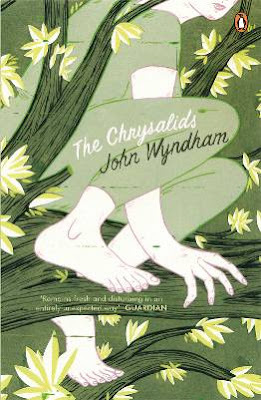 Chrysalids is one of my favourite novels and it's a great title too. 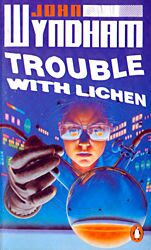 Why did the American publishers mess with the title? 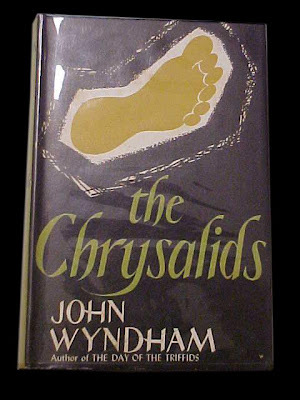 Yes, 'Chrysalids' is probably his best, but 'Triffids' behind by only a nose/leaf. Still don't know who did those new Penguins--the style looks a bit familiar, maybe from a comics artist, but I can't work it out. Steerforth, you knew Peter Lord? Those covers are great! I think I said in the post that they're the covers I grew up with too. 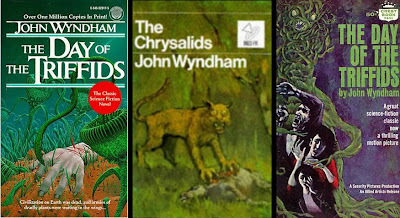 The 'Midwich Cuckoos' one in particular freaked me out, and I love the way that his triffids look like real (but dangerous) plants, rather than the B-movie monsters most other artists have come up with. 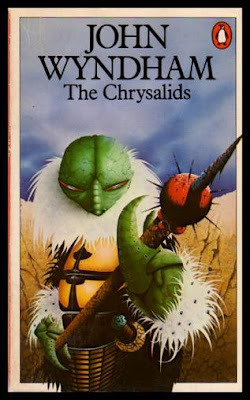 I'm not usually a fan of audiobooks, but my wife borrowed one of 'Chrysalids' from a library once, read by James Wilby, and I couldn't help getting sucked in. Had a look in Waterstone's today: the new Penguin covers are by Brian Cronin. 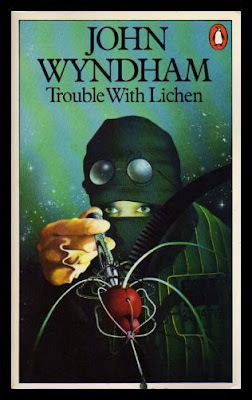 I still think they're terrible, far too bucolic and gentle in style for Wyndham, who really wasn't as cosy as Aldiss suggested. Ah, magic. Thanks for that, John: I'll amend the post accordingly. 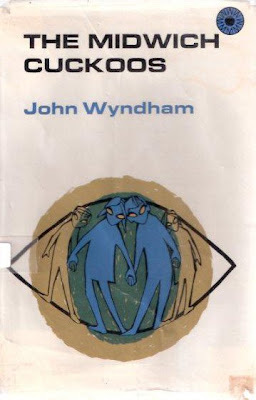 And you're right--just because Wyndham's work often focused on middle-class characters, there was nothing "cosy" about the horrors he inflicted on his fictional worlds. I like Aldiss a lot, but he was wrong on this one. 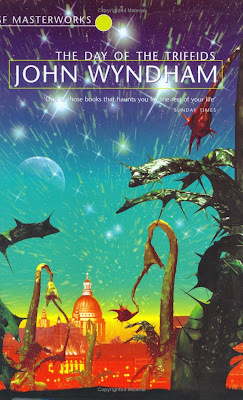 Hi, I discovered John Wyndham in secondary school where we had to read a couple of books for English (I'm Dutch btw). 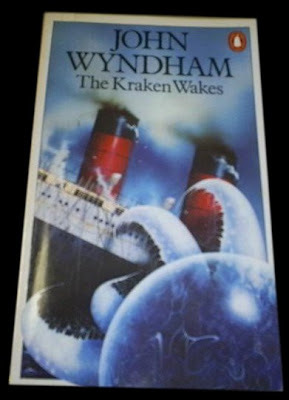 I remember picking The Kraken Wakes because of the cool cover. 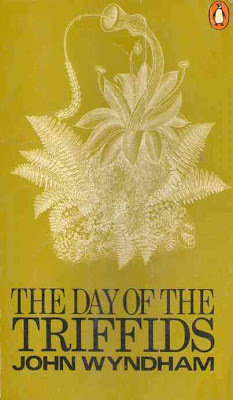 I also remember that I thought it was a thrilling-though difficult- book to read. 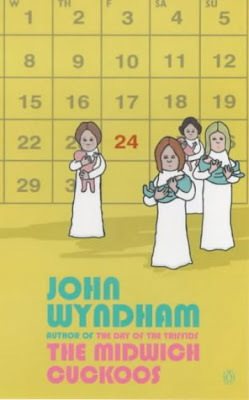 Now, a decade later, I find myself drawn to John Wyndham again, and thankfully understand his writings a lot better. 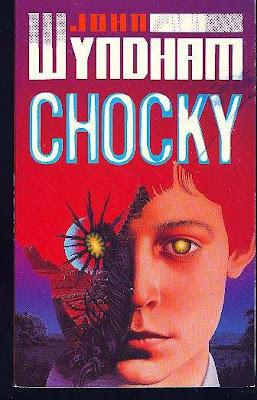 I just finished The Day of the Triffids & The Chrysalids and now started reading Chocky (the cover of my version actually isn't portrayed in your taxonomy, you might want to add it?) 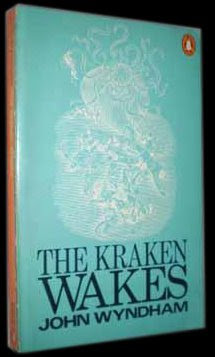 After that, I'll turn to The Kraken Wakes again, this time intent on catching every word. I refuse to read it in Dutch because I don't believe in translations (one way or the other, translators do leave their mark on someone else's writing). A work has to be read in which it was written. 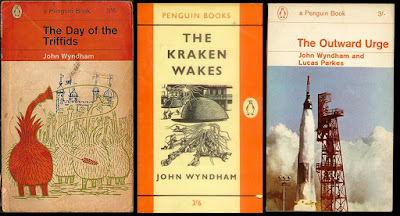 Finally, I'd like to add that I agree with you on the new penguin covers; they look horrible. Wow! 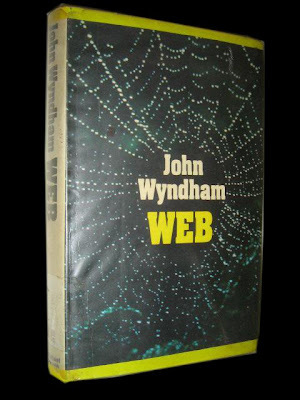 This is one of the most impressive collections I've ever seen of Wyndham covers. 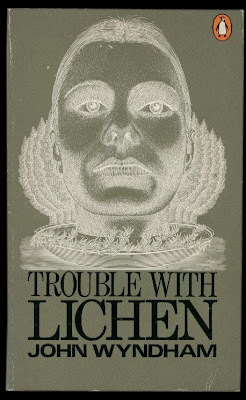 My favorites will always be the Richard Powers and Peter Lord illustrations. 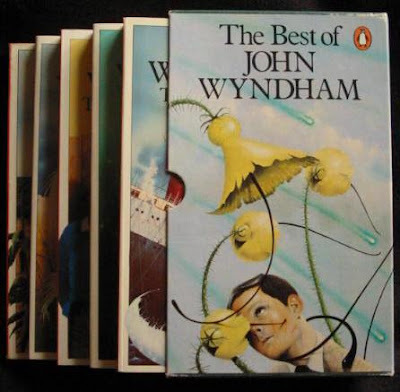 I have all of the Lords but only recently discovered the existence of that box-set "Best of John Wyndham" art that he did. VERY cool page, thank you so much for uploading all of these. I'd be curious to know what you think about Plan for Chaos! Thanks, Brett! 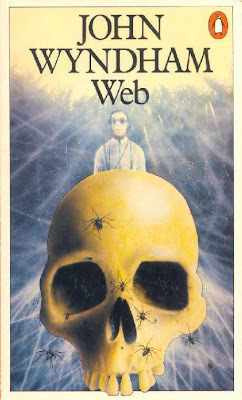 It's hard for me to be objective about the Peter Lord covers--they were the way the books looked when I first read them, so that's the way they look in my head still. 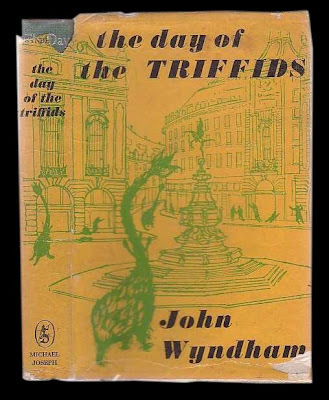 I enjoyed Plan for Chaos, but I'm pleased Wyndham decided to go down the more realistic 'Triffids' route for the rest of his career, rather than the pulp action style Chaos did very well. THanks for the reply! 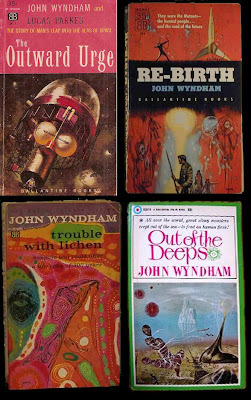 Do you have any idea if Peter Lord illustrated any other books than the Wyndham set? It would be fascinating to see more examples of his work, but since it's such a relatively common name, it's difficult to find anything just by Googling. I'm afraid not, Brett: I've searched ABE using his name too, but turned up thousands of false positives. I'll let you know if I do find out anything more. Oooooh, that looks beautiful. And expensive! I'm going to hunt around online to see if I ca find more of the interior illustrations. Thanks for the link!